Speed Camera Contractor Brekford Corporation has published a press release boasting that they have been awarded multi year contract extensions which allow them and their clients to avoid newly created speed camera rules for years to come. Brekford Corp. (the "Company") (OTCBB: BFDI) (OTCQB: BFDI), a leading public safety technology service provider of automated traffic safety enforcement ("ATSE") solutions, parking enforcement solutions, and an end-to-end suite of technology equipment for public safety vehicle services, today announces contract extensions of its existing clients including the City of Laurel, the City of Hagerstown, and the City of Salisbury, Maryland. With many of the Company's Maryland contracts due to expire this year, extension discussions were complex as the Maryland legislature was debating SB350, also known as the "Speed Monitoring System Reform Act of 2014," which became law on June 1, 2014. Among other revisions to the original 2009 legislation authorizing cameras statewide in Maryland, the Act states that a presently existing obligation, contract, or contract right may not be impaired in any way and that the Act does not repeal any current obligation, contract, or contract right in existence before the effective date of the Act through June 1, 2017. We are excited to be awarded multi-year contract extensions with an overwhelming majority of our clients," commented Rod Hillman, President and Chief Operating Officer of Brekford Corp. "This validates Brekford's commitment to superior customer service and integrity with respect to supporting critical public safety initiatives such as ATSE. 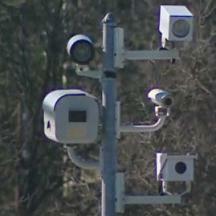 In other words, the speed camera "bounty system" is still alive and well, and will be unaffected for years to come. The authors of the newly passed speed camera legislation, who want you to believe "everything is just fine now", have been conducting a public relations campaign claiming how this bill fixes the gaping problems with Maryland's speed camera law. Of course the Maryland Divers Alliance knew all along this bill was "reform in name only" and that nothing would be different on June 1 when it went into effect. We have written about this bill at length previously. The fact that local governments could sign new contract extensions to avoid all the new rules for years to come was one of the issues we raised. But this is issue which the cheerleaders for the meaningless reforms, who want people to incorrectly think that they systematic problems with Maryland's speed camera law are all fixed (so they can come back in future years and work to expand speed cameras), are entirely glossing over. Brekford's press release comes on the tail of news that the Town of Morningside did not continue their contract with Brekford for the town's troubled camera program. However it's not completely clear whether the discontinuation of that contract was the idea of the town, the contractor, or a mutual decision. We have argued that the speed camera reform act is merely a paper tiger intended to mislead the public and the press in an election year, and that it will actually have little or no practical effect. Right off the top, the state exempted their own program from all new rules, since the SHA's program is covered by a different statute than the one which governs local speed camera programs. Montgomery County has boasted that the bill will have little effect on their own program, and in fact that they wrote much of the bill's provisions. The Montgomery County Sentinel wrote that Montgomery County Police Captain Tom Didone stated that their program would see "few changes" under the new rule, and that he had "worked closely with Delegate James Malone (D-12A, Baltimore and Howard Counties) in drafting the legislation". Didone also confirmed in the Sentinel article that the bill would allow a "hybrid-type lease”, rather than a flat fee, to replace their existing "per ticket" arrangement. Our own analysis of the bill is that such "hybrid" leases could still pay based on ticket volume, so long as they do not state that they are explicitly "per-ticket". Should anyone double that such a legal gimmick is possible, they need only look at the fact that the rules of the original law were supposed to ban payments based on the number of tickets in the first place. However Mongomery County's team of taxpayer funded attorneys INVENTED the loophole which is now commonly referred to as the "bounty system", and all the other local speed camera programs in the state followed suit. They are now no doubt working to circumvent the new rules to continue paying based on ticket volume in some way indefinitely. 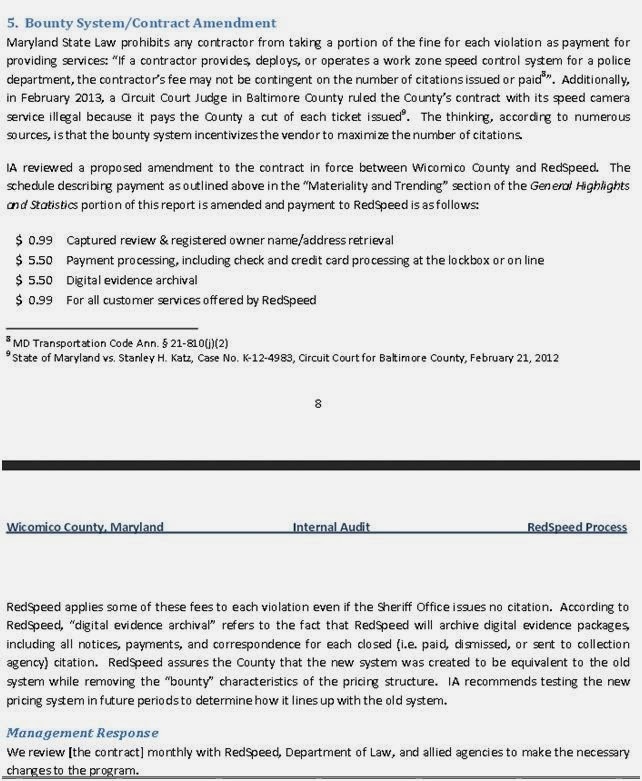 Indeed Wicomico County has proposed a way to get around the "bounty system" ban, before it was even passed, by breaking the per-ticket payments into four separate payments based on ticket volume, which their vendor has stated was "created to be equivalent to the old system" they had before. Of course as is made plain by Brekford's press release, they don't need to worry about that for 3 years anyways. By which time you will have forgotten about this posting, the public will have forgotten about the tens of thousands of false accusations made by erroneous speed cameras in Baltimore, state lawmakers making promises to you now will have been safely re-elected, and speed camera companies and taxpayer funded lobbying groups working for local government speed camera programs will be hard at work trying to expand automated enforcement and remove existing restrictions in the law. Don't you just love politicians? $ick of $cameras? Get out and VOTE!